Gilbern is not a name that immediately springs to mind when you think of classic British sports cars. In fact not many people know about the former car maker that hailed from Wales. 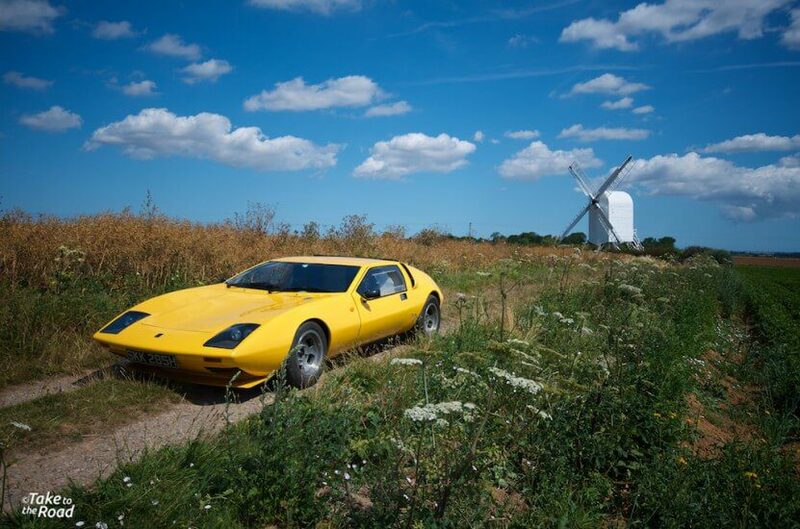 And even fewer are aware of its exciting two seat, rear engined sports coupe project from the 1970s. 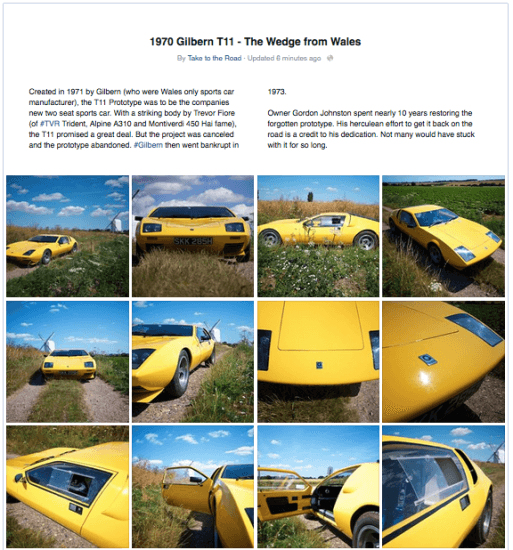 Founded in 1959 by Giles Smith and Bernard Friese, Gilbern was Wales’ only car maker. 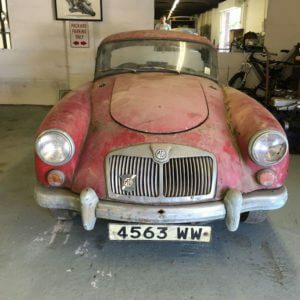 Both the former butcher and the former German Army soldier succeeded in building a car company from nothing and for a time challenged the likes of Jaguar and Rover with the Gilbern Genie V6. By the time the company folded in 1974, over 1000 Gilbern’s had been built. 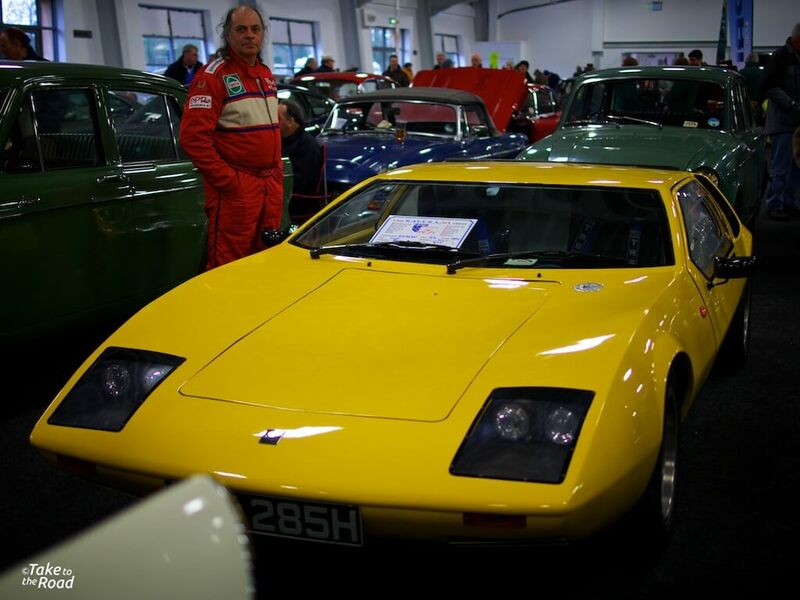 Gordon with his Gilbern T11 at Detling in March this year. I first came across Gordon Johnston’s Gilbern T11 Prototype at the Heritage Transport Show at Detling in Kent back in March of this year. As I was strolling around the show grounds, casting my eye over the many assembled classic cars, one in particular caught my eye. At first it was the bright yellow paint that stood out. And then it was the shape. It stopped me in my tracks and made me pause for a moment. I had no idea what it was and yet it somehow seemed familiar. Then I spied the Gilbern badge on the bonnet. However I was still none the wiser. Yes I was well aware of Gilbern GTs, Genies and Invaders but not this. So I spoke with Gordon who told me all about the car’s history and how it was the prototype T11 and was the only one in existance. It was a fascinating story and I knew straight away it was one I needed to capture. The story of the Gilbern T11 starts back in 1970 when the Welsh car manufacturer was looking for ways to expand their model range. While their fibre glass bodied cars proved popular, they were expensive and never sold in large numbers. As a result the small firm struggled financially and needed something different to turn their fortunes around. They decided to build a light and compact, rear engine, two seat sports coupe, handing over the design to Trevor Fiore. The project went from the clay model design stage to the production of a partially built prototype. The aim was to display the car at the 1971 Geneva Motor Show but that never happened. As the firm’s finances worsened, the project was cancelled and the T11 prototype along with the other three prototype chassis’ were abandoned. When the firm finally went bankrupt in 1974, the partly assembled Gilbern T11 was taken home by its managing director where it stayed for a number of years. It was then passed on to the Gilbern Owners Club before changing hands again, eventually ending up with the owner that Gordon eventually tracked down in 2000. The T11 has a very attractive wedge profile. It sits very low and it’s thin wide windscreen enhances it’s wide profile. Listening to Gordon’s story of how he acquired and restored the car from 2000 – 2009, I was amazed at his determination and drive to get the car back on the road. As restoration projects go, this one was the mother load. The task that lay ahead was huge. First of all he had acquired a car that had sat for decades. Then there was the fact it was an unfinished prototype. Restoring an old classic is one thing but finishing a car that never got beyond the prototype stage is another. Thankfully Gordon’s background as a mechanic meant he had the skills needed to get it done. And he had a vision that allowed him to put his own stamp on Gilbern’s wedge. If it had been anyone else I suspect the car would still be in pieces today. Gordon added the front louvered panels to allow air to feed the twin radiators. Gilbern hadn’t gotten round to that. The front splitter helps feed air as well. Along with getting the chassis stripped and restored, Gordon had to source new components for the car, rebuild the engine, rebuild the suspension, design a brand new interior (as Gilbern had never put one in it) and get the old fibre glass body restored. I can only imagine how he must have felt when he was told the original body was beyond repair. It was therefore a real stroke of luck that Gordon managed to track down the original body mould and get a replacement made. Again this was a demonstration of his determination to succeed, despite the odds. And at the back of his mind was the Gilbern Club’s 50th Anniversary meet in 2010. That was the ultimate deadline to get the car on the road. A deadline he managed to meet with the car going on public display at the Scuttleworth Collection in 2010. It was not the Geneva Motor Show that Gilbern had planned for in 1971, but the car was finally in the public domain. It was a remarkable achievement. 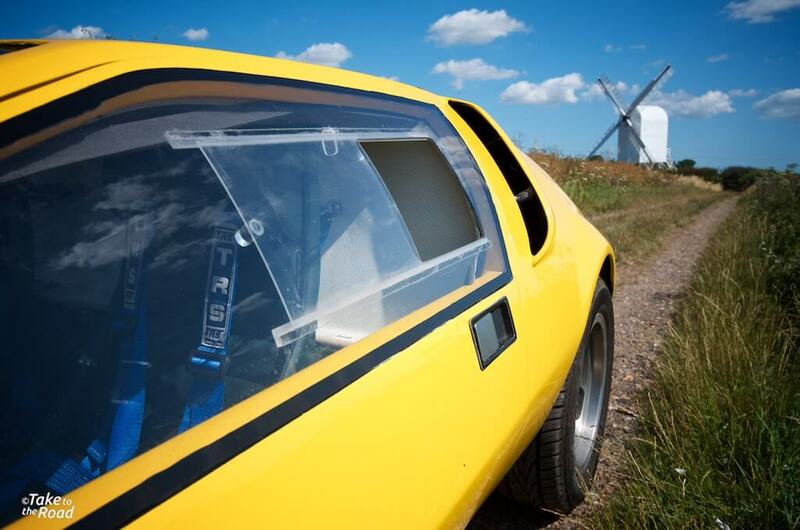 The side air vents and the curve of the rear share a likeness with the De Tomaso Mangusta. However it seemed faith had one more cruel plan for the T11. When Gordon described how his car was rammed into the barriers on a motorway by a lorry, I thought to myself “what next? !” Clearly there was something about this car that was trying to sabotage it. Was it a Gilbern jinx? Who knows. It was therefore perfectly understandable that Gordon had to walk away from the car for a while. After so much hard work to have been put out of action by the actions of a careless driver, it must have been soul destroying. But his determination and desire to keep this one off prototype on the road won through with the installation of the Toyota MR2 engine and gearbox. The extremely curvy rear end softens the sharpness of the front end and gives the car a very wide stance. After spending the day with the Gilbern T11, I am still struck with how impressive it looks. 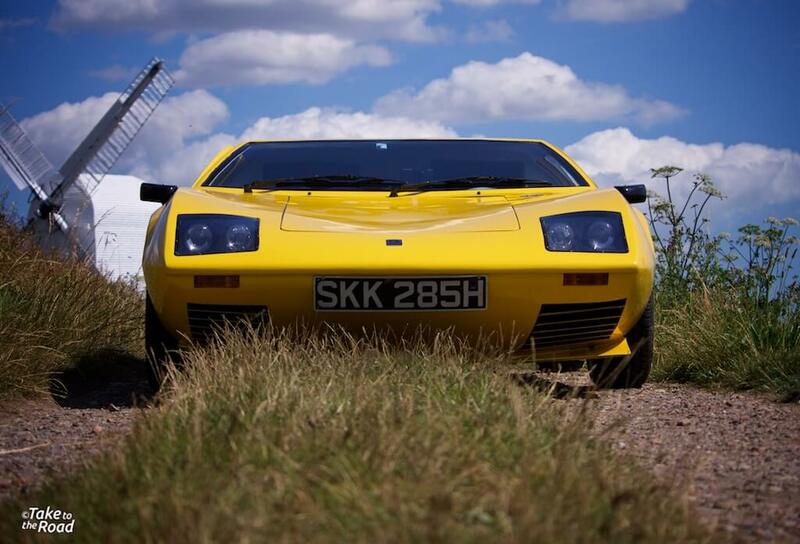 It’s bright yellow paint is very bold and really suits the car. It sits extremely low to the ground and makes my Bertone x1/9 look like it is on stilts. It has a wonderfully sharp profile to the front with an equally wonderful rounded rear end. And it has a real purposeful look to it. You could even say the front end is kind of angry thanks to the inwards tapering of the bonnet. The more I look at this car the more I admire Trevor Fiore’s design. It really was a work of art, taking cues from many other exotic sports cars of the day. 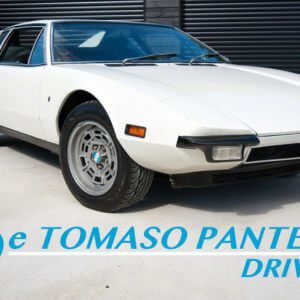 Its design echoes that of the De Tomaso Mangusta, the Ferrari Daytona and the Bitter CD. And of course there is the Montiverdi Hai 450SS. The similarities between the two are uncanny. While the Gilbern T11 did not have a V12 or a V8 powerplant, it made up for this with its striking overall design. You could park this car beside a Lamborghini Miura or a De Tomaso Mangusta and it would not look out of place. It looks that good! It does make me wonder then what Gilbern could have achieved if they had succeeded in taking the T11 to full production. The side profile of the T11 is very impressive and you can easily see the Montiverdi 450 Hai SS in it. So would I buy a Gilbern T11? As only one was built it’s not a car you can find lurking in the classifieds, so obviously you can’t just go and buy one today. But the T11 is not the car for me, purely because of my height. While it was fantastic fun riding as a passenger in Gordon’s car (it’s very very quick and feels like a go kart! ), the lack of head room was a major issue. Basically the T11 was not designed for people who are, shall we say, vertically challenged. Its roof line is extremely low which also makes getting in and out of the car an interesting exercise. 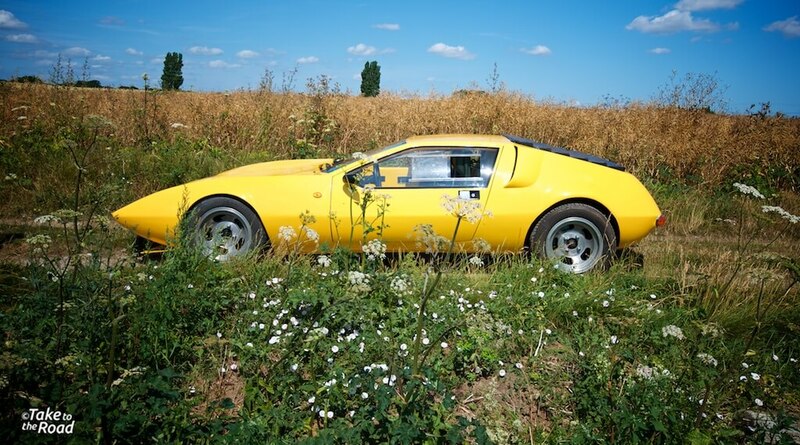 It is about as graceful as climbing in and out of a Lamborghini Countach. However, we are talking about a prototype here and the lack of cabin height is something Gilbern may well have addressed after further development and testing. Our favorite angle of the Gilbern T11. It really emphasizes the cars snarling face and low profile. Despite the cramped cabin, I do love the Gilbern T11. 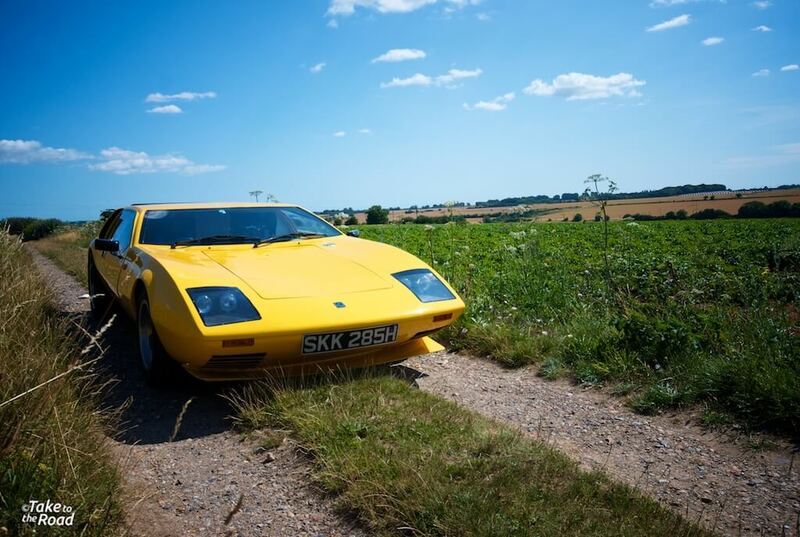 It is one of the most striking wedge inspired sports car designs of the 1970s. I love its aggressive front end and how shapely it looks from the rear. 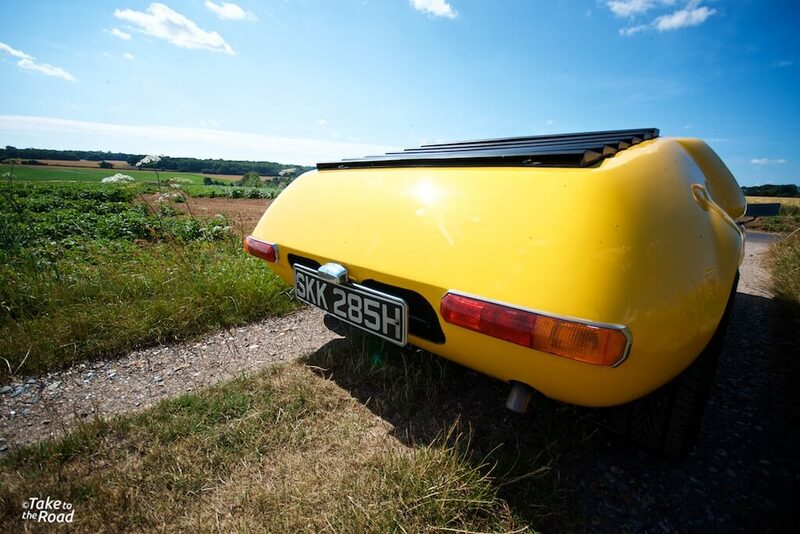 It is a proper sports car and a unique slice of British automotive fibreglass design. And if it wasn’t for Gordon Johnston’s herculean efforts, the Gilbern T11 would most likely have been lost forever. The end result is a real credit to Gordon’s passion and determination to succeed, despite the odds being stacked against him on more than one occasion. He was the right man with the right skills who turned up at the right time to save this car. And I think Gilbern and Trevor Fiore would have been very proud of the end result.